Isolating nucleic acids is often the rate-limiting step in molecular diagnostics. Removing inhibitory substances and preparing high-quality extracts with a quick turn-around time are critical for successful downstream processing. 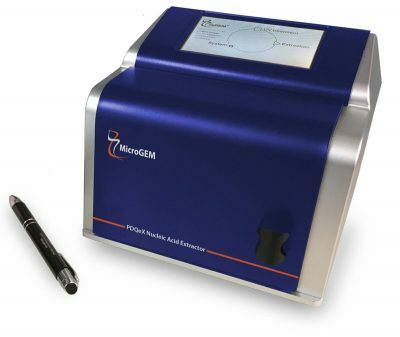 MicroGEM’s PDQeX Nucleic Acid Extractor brings together powerful proteinases and mesophilic cell wall degrading enzymes with an innovative extractor cartridge, creating a closed-tube system to lyse cells, destroy nucleases, digest proteins, and release nucleic acids. This approach prevents contamination and has no laborious sample preparation, while producing extracts in significantly less time (minutes rather than hours) than other extraction methods. Find additional product and purchase information here. Rapid extraction of DNA suitable for NGS workflows from bacterial cultures using the PDQeX. BioTechniques. 66(5), 2019 (pdf).